Zlatan Ibrahimovic seems to always be the talk of the town. Whether it be by himself, in the third person, or every team he has played for who talk about him like a jealous ex-girlfriend, it does not seem possible for him to fly under the radar. Maybe it’s his 1.95m (6’ 5”) frame that makes it impossible to hide, but I’m guessing it’s his larger than life talents that keep him in the headlines. The question is, do we love him or loathe him? Very few people are delusional enough to criticize his footballing talents. Maybe it’s the black belt he holds in Taekwando, or maybe it’s just that he is widely regarded as a world class footballer. However ask fans of some his former clubs: Juventus, Inter, or Barcelona, and they will use terms like traitor, mercenary, selfish, primadonna, or lazy. Whether these are just the cries of scorned lovers or if they truly believe these claims after surviving Ibra, it is hard to know. Fans are not the most logical group of people on the planet. But I will say that one of their other claims has some substantiation: that Ibra goes missing in the big games. After watching him play in Champion’s League with Milan this year, though, I might have solved this mystery. Everyone kept saying “See, he always goes missing in the big games.” So I watched, and I think I found him. He was underneath 3 defenders’ cleats, his shirt being held by 2 more. It’s no wonder he was missing, even the ref couldn’t spot him. What can I say? The man is like a defender’s magnet. If he could score under those circumstances, then he would really be something special. Some of the negative press Ibrahimovic gets is warranted, though. This year, with AC Milan, he has managed to accumulate 8 yellow cards and 2 red cards, the latter resulting in 5 games’ worth of suspensions. (I guess those refs saw him!) It has been implied that some of these disciplinary measures were given him because of his size or reputation. Maybe. But the red cards were definitely given him for momentary lapses of intelligence. Where much is given, much is expected. Ibra earns a reported 9 million a year, so he is held to a higher standard than someone with less repute, size, or salary. And so, when your tallest, highest paid player does something stupid, there is going to be more backlash. Not that I value the media or its agenda, but it is fair for his teammates to ask what kind of liability is he? Is he worth it? 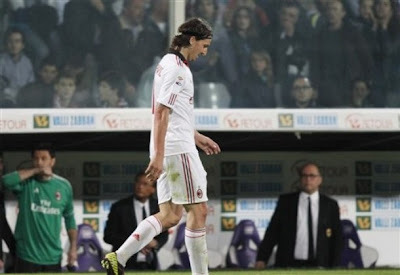 Truth be told, in the first Milan derby this season, I loved when Ibra flew into Materazzi and knocked him unconscious. (As a Milanista, I can be quite devilish.) And while this has amused thousands or more throughout the world, it was a little telling - Ibra was willing to risk a red card on a single play. We know he is a physical player, but can he rein his raw instincts in for the good of the team? Gratefully, I think he is learning. In the most recent Coppa Italia match v. Palermo, we saw him go for the bicycle kick but then alter his course and sacrifice the potential goal to avoid cleating the nearest Palermo player in the face. So I do think there is hope. And a learning curve and a desire to be a good teammate that is bigger than ever. Certainly, there was regret for the suspensions. People see Ibrahimovic as this giant, win-at-all-costs kind of footballer who also holds a black belt, and I think they forget that off the pitch, he is not so feared. For example, he and his long-time partner have 2 young sons. And despite being a high school dropout (he dropped out to pursue football,) he is fluent in five languages. He is also known for his generosity. He personally funded a new football pitch for kids in his hometown. He also donated brand new jerseys to his youth club in Sweden. More recently, he invited a child in a wheelchair to attend a match, giving him his game jersey at the end. And he used his prowess at Milan to get a trial for the son of his contractor, whom he had kicked about with at his home. Praise also comes in the numerous trophies and titles he as won. He is working toward his 8th consecutive league title with his club teams, those clubs being in three different countries/leagues. Coincidence? I think not. Is he some kind of good luck charm? No, good luck charms are inanimate, and Ibra certainly is anything but. He gets paid so well because he earns it. He doesn’t earn it in only goals scored, or his current 2nd in the league with 11 assists status he’s got this year. He earns it by leaving it all out on the pitch every game. And I mean that literally. There was at least one match near the beginning of the season where he was vomiting on the pitch at the end of the game. Disgusting or not, I love a player who gives everything he has. Past players have taken note of him, too. In fact, the legendary Marco van Basten compared Ibra to himself in an interview from the December 15th Football Italia. He said “Ibra has formidable power, but also good technique,” and also indicated that he often saw himself in Ibrahimovic. I know on paper I should consider him a liability. The cards, the kicking of his teammates in training, the frustration that sometimes gets vented dangerously. But he is such a complete player. People will say “Ibra didn’t do much today” because maybe he didn’t get on the scoreboard or something. But I always see him doing great things. And more so this year than ever before. He’s a leader on the pitch, and yes that includes yelling at his teammates, he’s got great vision and has shown that he is willing to sacrifice himself being the star to pull 2 defenders away from the ball, to make the pass instead of the shot, or whatever it takes to win the game. Even if his name isn’t in lights at the end. His passion exceeds his even his skills. Remember when he injured himself with his fist pump goal celebration? He really does give it his all every game. Plus, it seems that off the pitch, he is not the jerk that most people paint him to be. In fact, he seems like one of the more compassionate and charitable footballers around. So I know that many will disagree with me, and given the facts, I can understand, but I put Ibra in the ‘lovability’ category. Even if he's the guy you love to hate. I hope he stays at Milan until the end of his career. Ti amo Ibra! They Might Be Giants, Devo, Franz Ferdinand, etc.